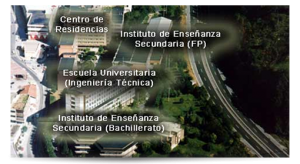 The Educational Complex, antique Occupational University, is composed by the Secondary School “Uni-Ermua Eibar”, which provides Bachelorship and Training Cycles, and the Hall of Residence. Next to the Educational Complex is located the School of Industrial Engineering, where you can take the branch of Renewable Energies. The School is integrated within the University of the Basque Country (UPV / EHU). Providing the established lessons for the appropriate levels in the Centers belonging to the Complex. To provide a hosting service to the students, enabling them to optimize their educational efficiency, with additional services that fit the requirements of the development of the educational activity. In the Hall of Residence of the Educational Complex reside students who pursue studies, not only at the referred Centers but also in others in the region, due to its proximity to the Hall of Residence.